The First8: From bottom left to right—March Wood; Endia Sowers Paige, Rashid Hughes. Top left to right is Chiquita Richardson, Jennifer Nash, Alice Bellis, Erin Johnson, Donna Lawson, Cleon Peoples. Washington DC Shambhala Member March Wood completed her Masters at The Howard University School of Divinity earlier this year. 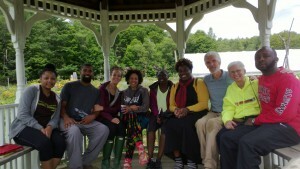 While she was at Karme Choling participating a weekthun in the fall of 2014, she had an inspiration about bringing some of her classmates (mainly African American Christian leaders) to experience meditation and the retreat container, as a way of cultivating new strengths and skills they can use as they serve their communities. 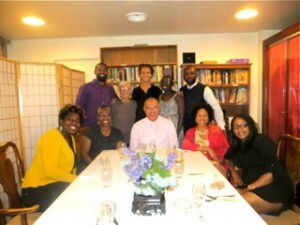 Cara Thornley, who was the Director of the retreat, was also enthusiastic about the idea; she solicited the interest and support of Acharya Gaylon Ferguson, and with the help of the KCL staff, they put together a plan for a 5-day immersive retreat for this group of Black leaders. The Shambhala Center of Washington DC signed on as a sponsor, so as to provide a tax-deductible platform to raise the funding to cover retreat expenses. March, DC Chagdzö Judy Gillespie, and DC Center Director Jayne Sutton started a campaign that raised the necessary funding in a little more than a week, and the retreat took place in July. We are viewing this first effort as a pilot we hope will move forward to build new partnerships and networks for social justice and racial healing. Following is a letter from the retreat group about their experience. 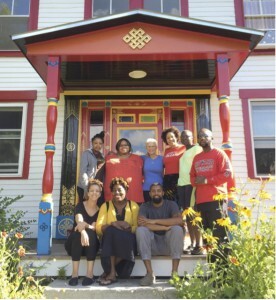 The First 8, eight members of the historically black Howard University community in Washington, DC, extend our gratitude to the unwavering commitment and generosity of the Shambhala community for our five-day retreat to Karmê Chöling this July. 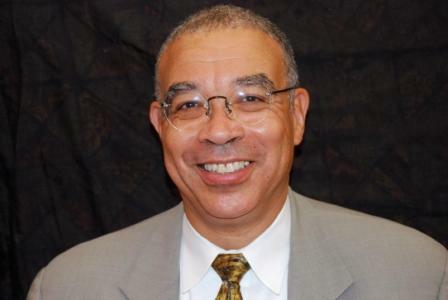 Our experience “can only be described as transformative!” shared participant Cleon Peoples. The participants overwhelmingly agree that the intimacy and encouragement of all of the retreat participants and our retreat team laid the foundation for a strong bond among us all. “Since our ultimate goals are not just personal, but social,” said Dr. Alice Bellis, Howard University School of Divinity (HUSD) faculty member and retreat participant, this bond was particularly important to bring back to our communities following this historic endeavor. 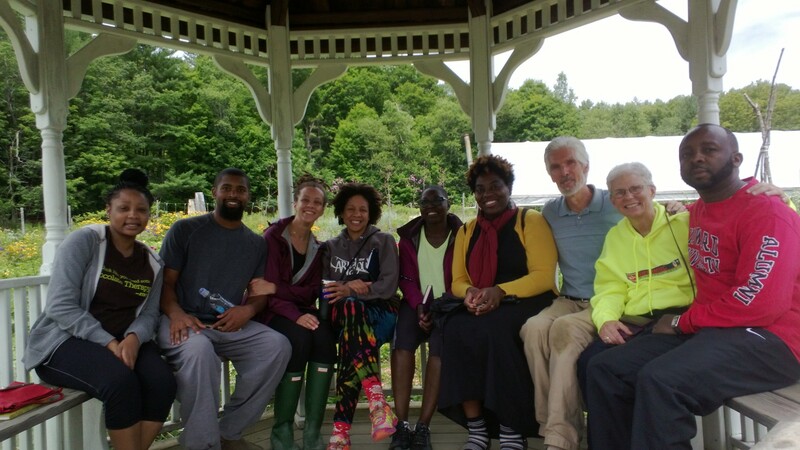 This first of its kind retreat was wonderfully led and skillfully facilitated by our all star Karmê Chöling team, notably Senior Teacher Cara Thornley and March Wood as co-coordinators, Acharya Gaylon Ferguson and Kasung Dr. Deborah Marshall as educators, and the entire Karmê Chöling community. March Wood, a HUSD graduate, conceived of this idea following her participation in a weekthun with Cara Thornley at Karmê Chöling. The rest is history! The natural beauty of Barnet, Vermont, and of Karmê Chöling contributed a magical background to our experience. “Karmê Chöling is much more than a place, it’s a sacred experience,” said participant Rashid Hughes. The true commitment to our cause and comfort by this retreat team and by the Karmê Chöling community as a whole allowed us to experience, together, “a unique cultural immersion that provided fertile ground for the safe development of multidisciplinary spiritual leadership,” shared participant Erin Johnson. Our teachers, the immersion into meditation practice and the overall exposure to Shambhala culture at Karmê Chöling, laid a safe foundation for us, both as African-Americans and as spiritual leaders, to discuss our collective struggle for citizenship amidst the ongoing genocide of our people, both as individuals and as a group. Our discussions were deepened from considering our struggle through the lens of the Shambhala vision of Enlightened Society, and witnessing the Shambhala response to some of the African American community’s most difficult ordeals. We read and discussed Sakyong Mipham Rinpoche’s July 2, 2015 letter to the Charleston, SC Emanuel African Methodist Episcopal Church, where he asked a question of great importance to all of us: “In this time of instability and extreme challenge, where can we find refuge?” “For me, the powerfully sacred answer to the Sakyong’s question is that we can ultimately find refuge within ourselves, through meditation” participant Erin Johnson shared. We also had the opportunity to view the Dhamma Brothers documentary about meditation successes in U.S. prisons (including the prison where Dr. Marshall used to work!) and the recent CBS News “Religion and Culture” feature highlighting the Sakyong’s meeting with members of Chicago communities empowering the collective pursuit of peace amidst gang violence. Finally, of the upmost importance to this retreat, was sowing the seeds for collective organized resistance. 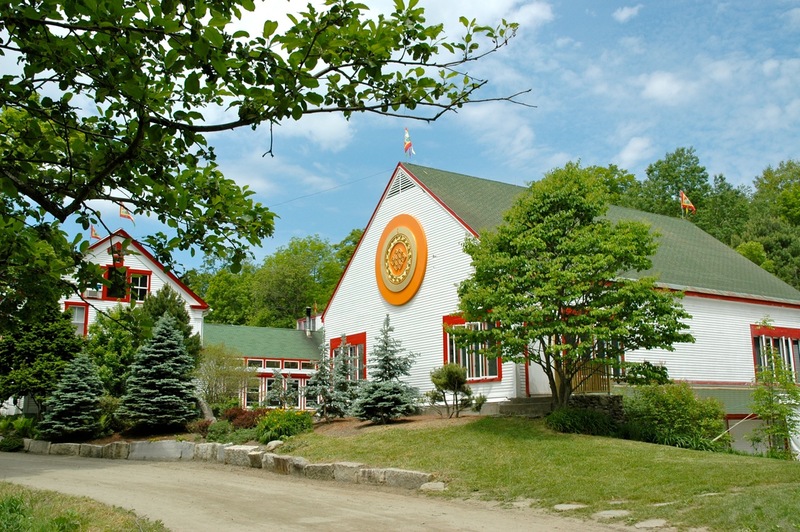 This was our call to the Shambhala community, and the community answered with a resounding outpouring of love, financial support, education, patience, compassion and kindness. We, as African Americans and as spiritual leaders, collectively recognize how powerful of a force this retreat, the practice of meditation, and the Shambhala tradition, can be not only in our lives, but as a galvanizing force aligned with the attainment of Enlightened Society within the Shambhala tradition. The First8: March Wood; Endia Sowers Paige, Rashid Hughes; Chiquita Richardson, Jennifer Nash, Alice Bellis, Erin Johnson, Donna Lawson, and Cleon Peoples. Editor’s note: if you enjoyed this article, you may want to see this video of Carolyn Mandelker’s interview with March Wood. E MA HO! We could definitely invite more of this kind of outreach, cross-over connection throughout our mandala. All will benefit, and the article shows how broadly the teachings of Shambhala can be applied and shared. Hear, hear!